After a lot of thinking, writing, sketching, and general reorganization of the mind I've settled on a game plan. I will rename my current project and call it Unicorn Training and call it's sequel Unicorn Quest. This first game will act as a prologue to my original idea. Making this smaller scale version of the game frees up a lot of possibilities for me while fulfilling the reason I wanted Unicorn Quest to exist in the first place. I'll have a cool RPG under my belt, I'll set the stage for a sequel that expands on the world I want to build, and I'll be able to make said sequel as my graduation project (hopefully with a budget allowing for a collaboration with a certain pixel artist I know of). 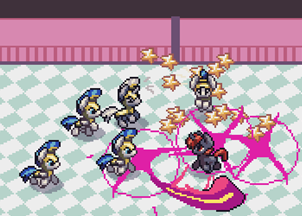 The dragon RPG demo that was going to be my senior capstone project can now get pushed back so I can start it right after Unicorn Training (I can't start my other pony RPG until the first day of mobile gaming class). Then I'll have 2 really cool games to my name (and hopefully an income above my current zero) before starting the two biggest RPGs in my head. The problem of scope does not come from hardware limitations but from my desire to be done faster. I've learned so much from getting this far that I really want to start over with my improvements in mind. The improvements are so time consuming and dramatic that I might as well just make a new game, so why not just split my project in 2? One to release now and another for me to do in class senior year. I'll have more time to work on it then and I don't feel my current direction will do the idea justice. See everything I wrote in my messy design document so far below the break. "You play as Clover, the young apprentice of the greatest sorcerer who ever lived. You are tasked with developing your magic by navigating through dungeons your mentor has constructed for you. At the end of the dungeon you will encounter a boss monster and by defeating it you will learn a new spell and increase your health by one heart. If you master the dungeon 10 times you will have learned every spell and can re-enter the dungeon again to see randomized layouts using rooms you've visited before (now with higher level enemies to keep up with you). In-between dungeon runs you can explore a small overworld with shops (to give you an edge), speak with townsfolk (to give the feeling of this being an actual world), fight respawning monsters unique to the dangerous forest (to level up before the next dungeon run), and find loot in the wilderness (items to make yourself stronger)." Shrink the game’s scope to make it easier to build. Retain important elements from original plan. Just focus on challenging dungeons and the surrounding forest where you can optionally grow stronger. 10 set dungeons, later playthroughs mix & match rooms and bosses. Enemies scale post-game. Forest enemies scale and swap out to more powerful foes. Swirllock has ventured beyond the Lurkwood for mysterious reasons. He warns to be ready for a quest upon his return, or whatever evil comes in his place. He left a newborn pixie and several notes to assist you. You live among the few Unicorns settled within the forest. Mostly researchers studying the forest’s magic at the risk of imminent monster attacks. You are disconnected from the rest of Equica because of the dangerous living conditions. Swirllock moved here to study the power life giving magic here in order to find a means of maintaining a permanent ecosystem on the floating island. A small few followed him. Instill that longing to see the world in the player as well (To be satisfied in the sequel). Parax has the ability to warp back to the observatory at any time. Some items are guarded by really tough enemies you’ll need to level up to beat. No dreamscape arena. The mixed dungeon satisfies replay. Don’t go showing this to IGN just yet. Wait for Pony RPG. Demo goes to end of 1st dungeon, one cave, and a few forest areas to explore. Block off the gem cave and other regions with NPCs and rocks. Theming with the dungeons. Fire is aggressive and rooms grow in size. Shield is about staying alive. Water uses the environment. Frost is about avoiding trouble. You can replay old dungeons or mix rooms based on ones you've beaten. Multiple ways to solve rooms based on the magic you have. Choose which dungeon to go into. Random dungeon is unlocked after beating at least 2. Gem Cave is the easiest way to dig for gems, but you have to fight gem stealing rat monsters that vanish through walls. Outside enemies are nature based. Swirllock’s conjured things are mechanical and abstract. The gem eye is a common feature. Call sequel Unicorn Journey? 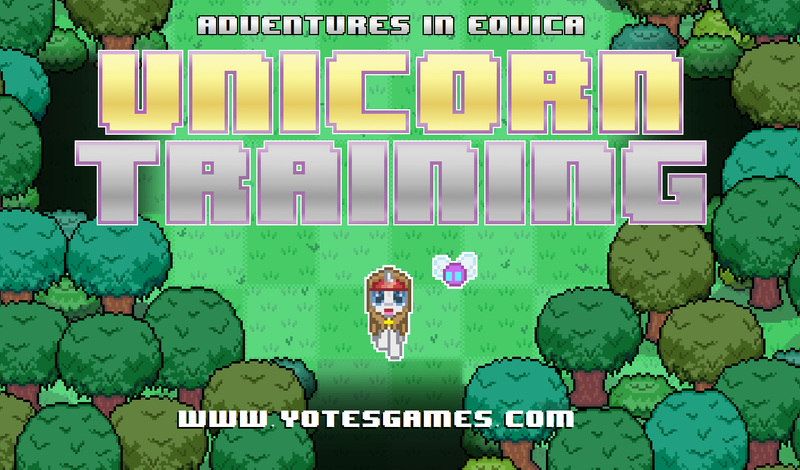 How About Calling This Unicorn Training and the Sequel Unicorn Quest? For $2.99 multiplatform. Make Unicorn Quest after Dragon RPG using top down adjusted perspective sprites with rougelike elements and defeat the Zephyr who mastered a specific magic you have. Journey beyond the forest and into the Equica mainland in search of your missing mentor. Gives time to get feedback on combat & spell improvements. With Dragon RPG done you’ll have that action RPG experience to fall back on. Make Unicorn Quest more tactical. Maybe even turn based? Free movement in overworld but grid based in battles. Attacks have different behaviors and the combat is strategic. Different combat system in every sequel or make this one a staple? Portrait. Tiny, detailed sprites. Work with Pix3M if possible (If budget available). Think of Fire emblem, FF Tactics, and more. A year after first game’s ending; you get news that Swirllock has gone missing. Reported by the princess herself! She demands a meeting with Clover regarding protection of the kingdom in Swirllock’s place. On your way over you get ambushed by Zephyr and are taken to bright valley by strangers who nurse you. The search for your master and audience with the princess begins. Much more cinematic (using experience from Pony RPG & Dragon RPG). A lot more time to develop it (demo for graduation, then take time to finish afterwards). A PvP mode if possible? All about fighting (combat puzzles) rather than dungeons. Randomized battle maps for average encounters. Make this my grad game.